The clocks have gone back an hour here in the UK, so it's lighter in the mornings but will be darker earlier in the evenings. The first sign that Winter isn't far away. Todays card is another Christmas card. I know its Halloween, but not many folk send cards for this occasion here...hence so many Christmas cards. I hope you like this Magnolia Tilda. Once again painted with distress inks on watercolour paper. 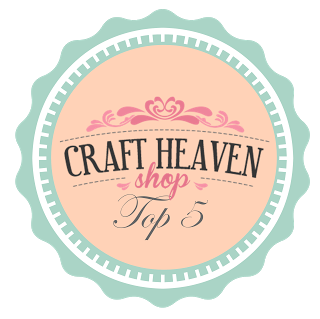 There is a range of doilies, dies, pearl stringing, lace and glittered velvet ribbon. The bow holds a rhinestone snowflake. This card is for sale on eBay. 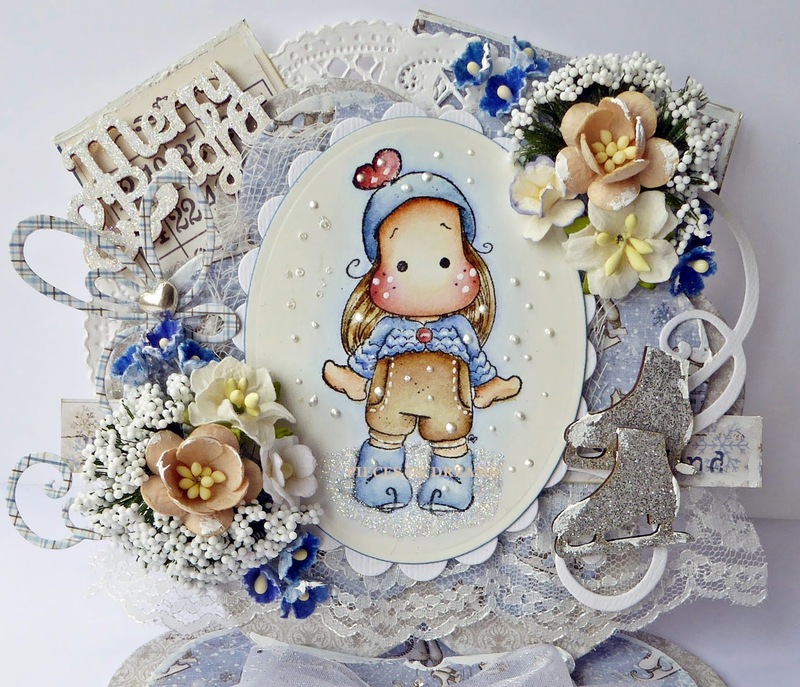 Search Magnolia Tilda Cards and you will see her there. Wishing you all a lovely Sunday. This Easel card was made a few weeks ago and uses a contemporary colour scheme of Lilac and blue. The poinsettias' Tilda is holding are glittered and really stand out. The light is vey bad today her in London, which makes the card look dull. Its anything but in real life. 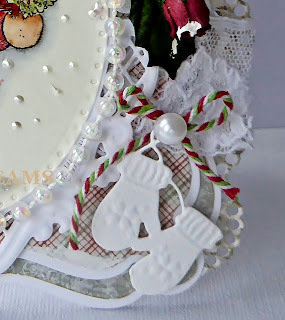 The opening tag on the base is hidden by an organdie bow and a rhinestone snowflake. It will be for sale on eBay this weekend. 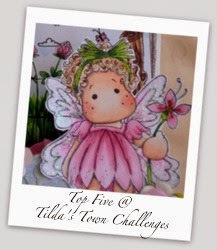 Just search for 'Magnolia Tilda Cards', and you will see it there. I made this card in reds and blues to create a warm atmosphere for Winter. It's slightly different to my other cards. In a good way I hope. The image is hand painted, using distress inks on watercolour paper. Her earmuffs, the fur on her boots and the ice she stands on are crystal glittered. 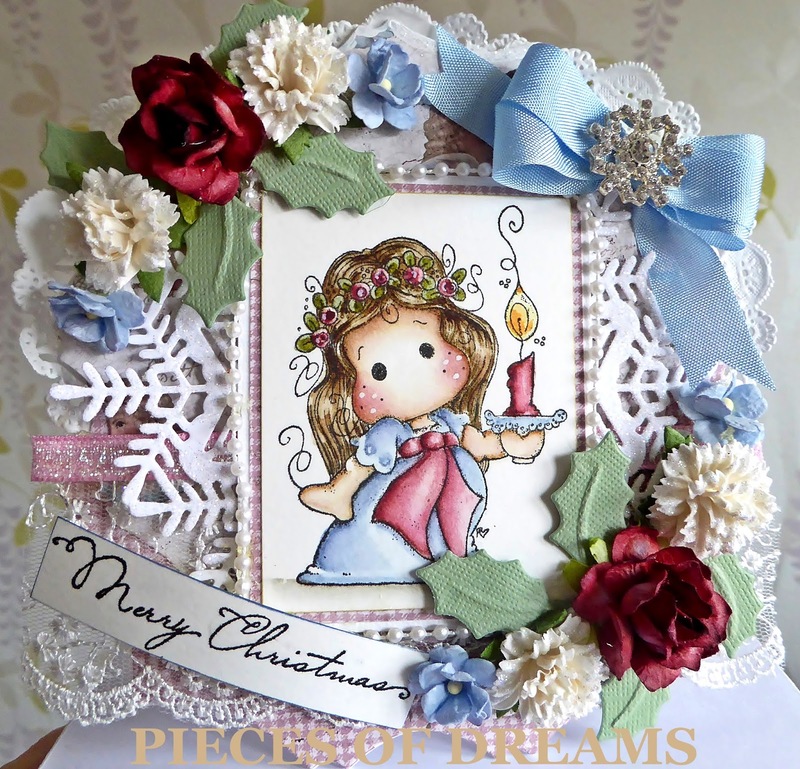 The sentiment and image is layered onto mirror card, with an added holly charm on the sentiment. The lace is rich guipure, so pretty and the die cuts and doilies echo its beauty. 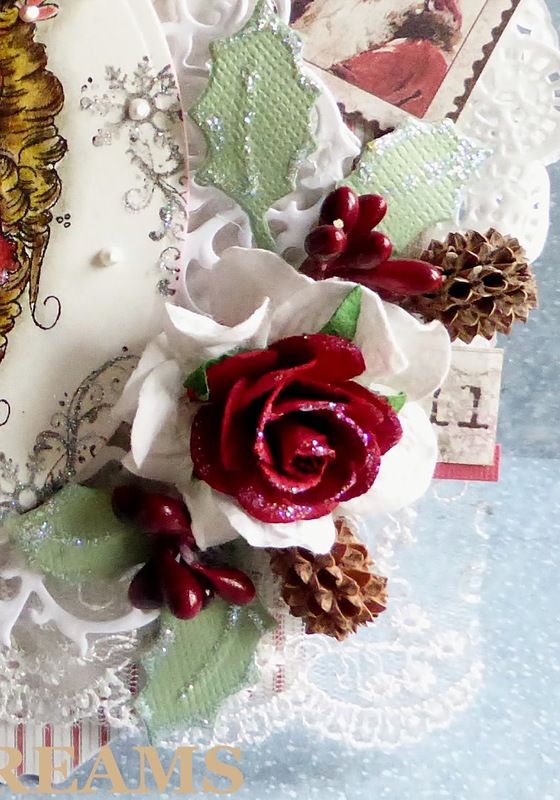 Tiny pine cones and berries decorate the holly leaves, with gesso snow on the flowers. The inside is fully decorated with a clear place for a greeting. It will be on eBay at the end of the week. This is a Friday post, because I thought yesterday was Saturday and put all my cards on eBay a day early! I woke up today thinking it was Sunday...those of you who now me will realise this behaviour is quite normal for me. The words Fairy and Away With, come to mind, ha-ha. Because of this mistake, I have another card to share. Lots of things going on here. Sometimes I don't know when to stop and I'm quite aware of that. As usual I painted this Magnolia Tilda stamp with distress inks on watercolour paper. 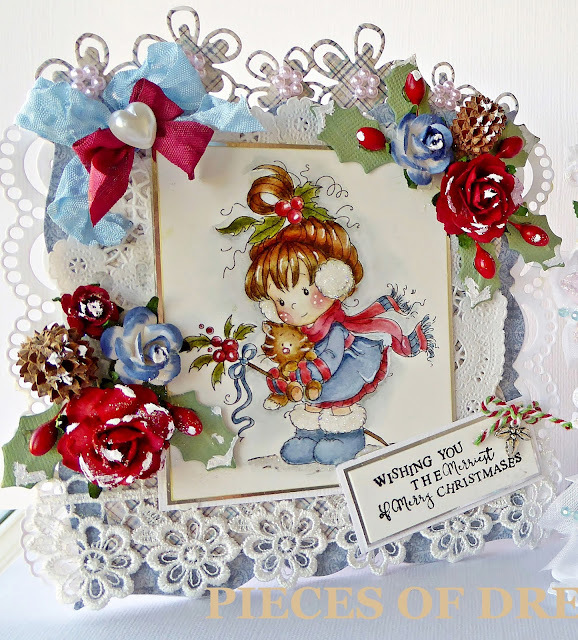 The holly leaves are made with Marianne Dies, the shape with GoKreate, and others are Joy Craft. 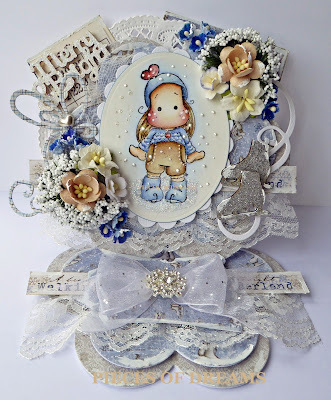 I gathered some of my special lace on this card, shhhh...its reserved for special cards only. I don't want to run out! The birds at the top are dusted with Glamour Dust so they twinkle. 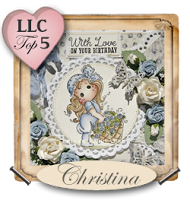 The little tags are held with bakers twine and paper doilies surround the card. 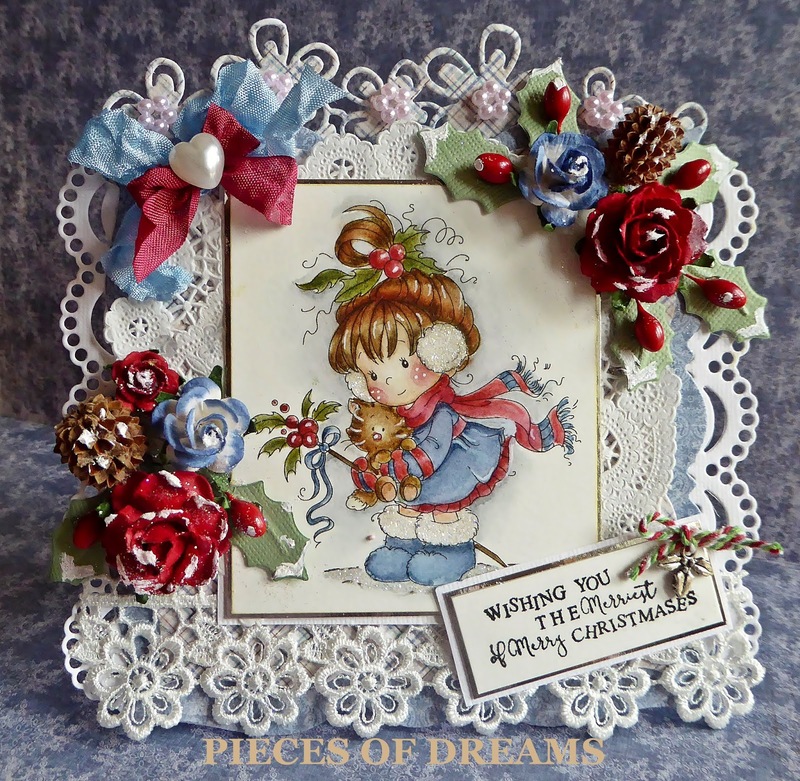 The flowers are mixed, by myself and I added Winter berries and 'cones', that I collected from the trees in Lanzarote. They are a perfect size for cards . Hopefully I will know that tomorrow is Sunday, but you never know. 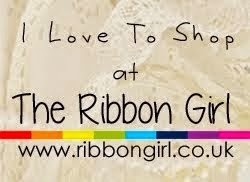 Please leave a comment if you look at my blog. I know a lot do...just say hello and I can follow you. the fireworks started yesterday for Diwali, so I have had two scared dogs to console AND I expect this will go on until after Christmas. Moaning me today! Here is another Magnolia Christmas card. This time Tilda has her Winter coat on, 'cos it's snowing...hence going overboard with the Glamour Dust. Ha-ha. So this picture isn't very clear. Will change it later. 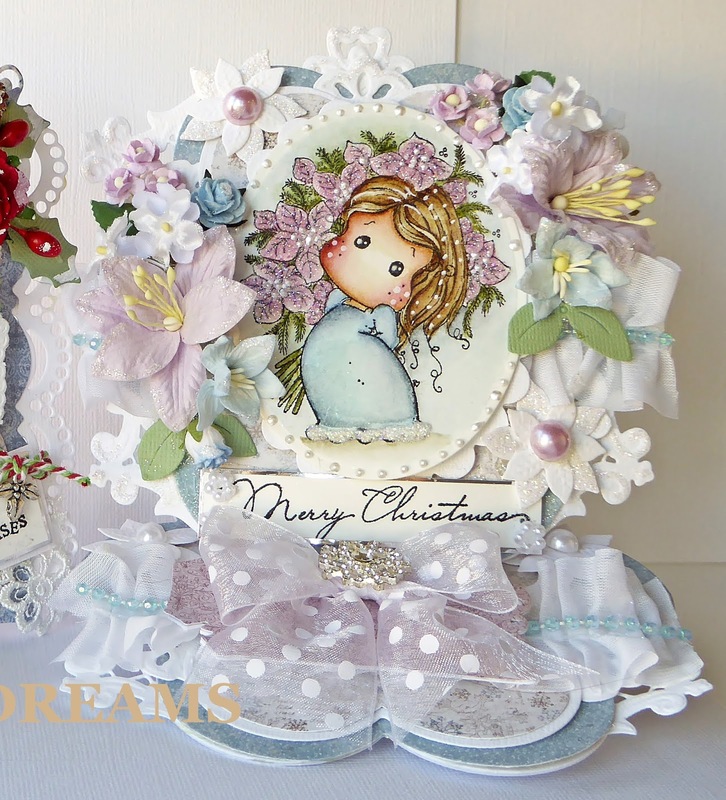 The dies are Marianne, flowers are Wild Orchid Craft and I have added a little gesso here and there. 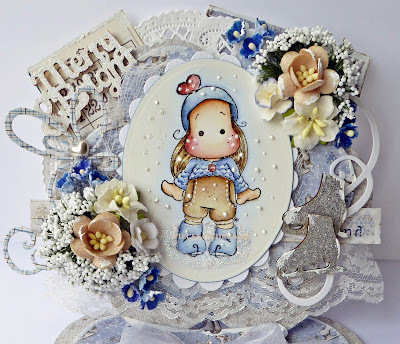 Tilda was painted with distress inks and the card was cut using Go-Kreate dies. Lace, mitt's, pearls and bakers twine. Flowers, pearls, die cuts and the sentiment. Magnolia Tilda Stamps and pursue my beloved hobby. Thank you to my follower/s for leaving me a comment or two. 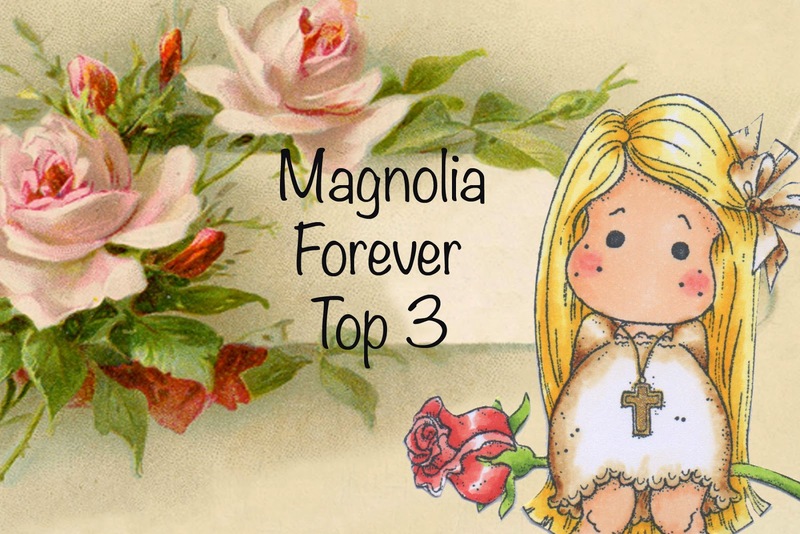 Good Morning Friends and Magnolia Fans. I'm back from a two week break in The Dominican. Of course I started painting as soon as I got back. It's part of who I am and I will be lost without it. This is today's Christmas card and it's made into an easel. All the dies used are Magnolia, but the wooden sentiment and skates were bought on line last year and decorated by me. 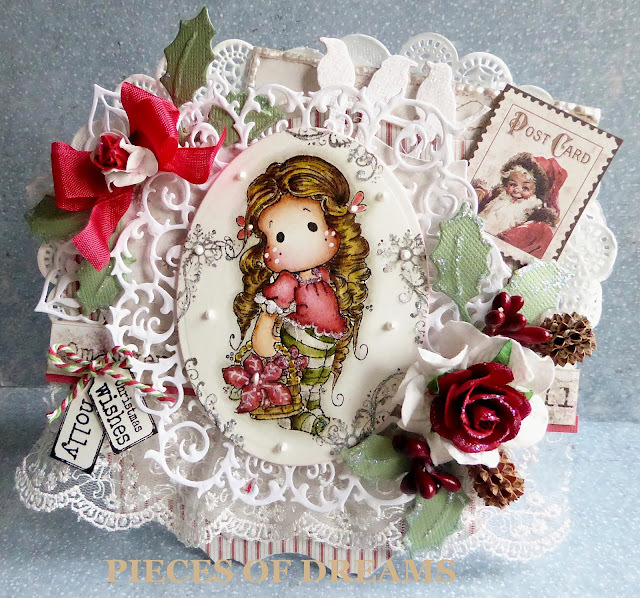 The lace, doilies and flowers are from my stash and all papers are from Maja Design. I rarely use anything else..love the vintage feel to them. 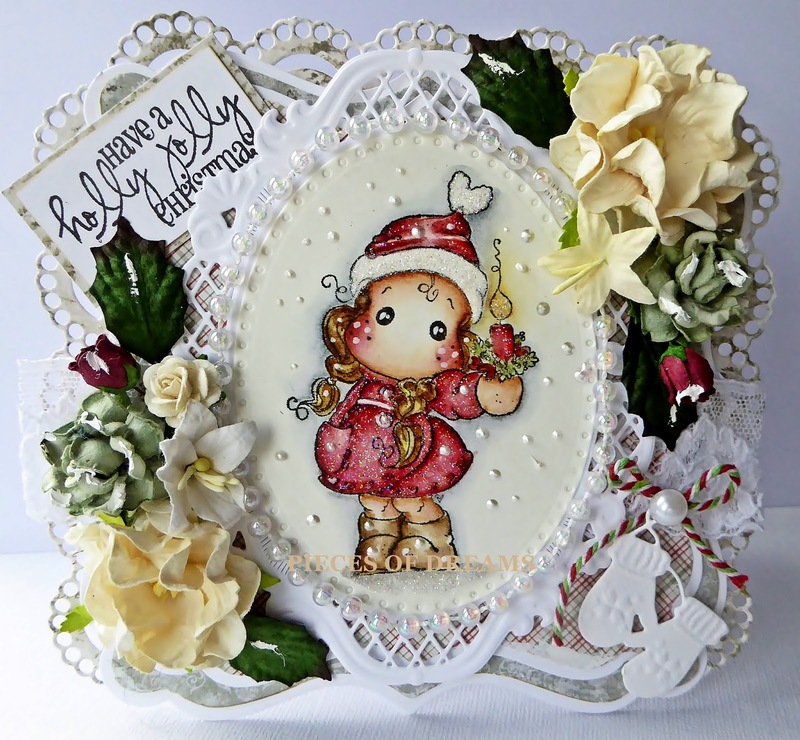 Once again, Tilda has been painted with distress inks on watercolour paper and glittered. The base has a tag, cut from a Magnolia die and it opens up for a Christmas greeting. 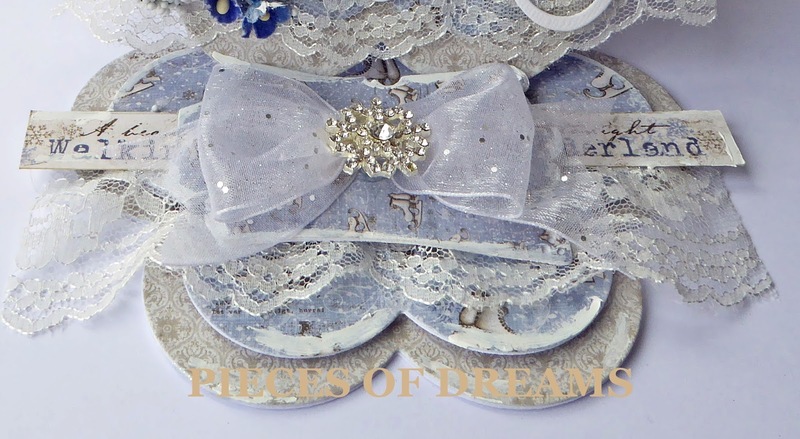 It has the same glittered ribbon, a diamanté snowflake and touches of gesso for snow. It will be for sale on eBay under Magnolia Tilda Cards.